Talbots Pty Ltd is a Sydney based firm of Chartered Accountants which was founded by Mr Frank Talbot in August 1926. 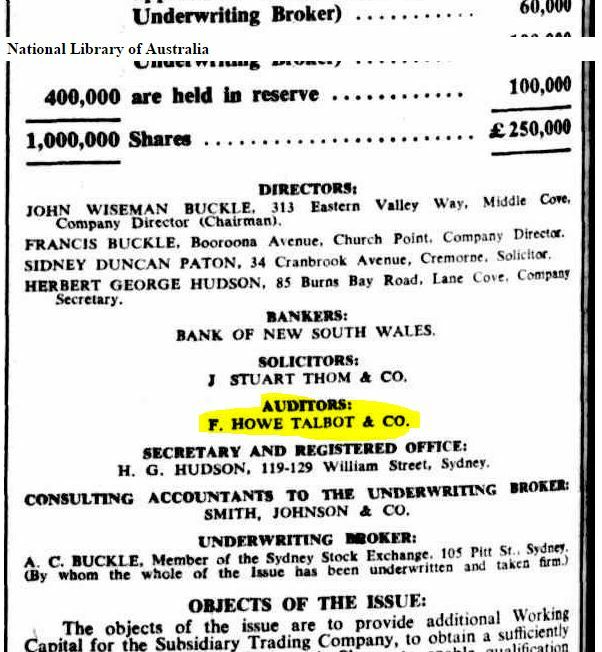 The company commenced trading as F.Howe Talbot & Co, with the name subsequently shortened in later years to that of the current trading name of Talbots. We have celebrated over 80 years of continuous service to the business community. Talbots Chartered Accountants have been established to bring specialist advice that will be suitable for your individual or business requirements. Compared to other accounting firms we are proud to offer a personalised approach involving our best specialists as well as our partners being directly involved in the client engagement. As such we are able to maintain an intimate understanding of our clients and their business, financial and taxation affairs and can bring our experience and skill directly to the work performed by our firm. Our philosophy of work is not only helping with efficient and highly competent advice for our clients, but also ensuring that we are across all the complex accounting, taxation and financial matters and are able to communicate these in a simplified and understandable manner.